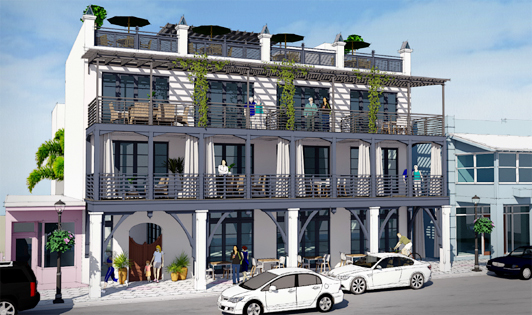 A new low-rise weekly rental apartment building on 8th Avenue designed to fit the architectural and style of the St. Pete Beach historic district. Guests will enjoy the quaint shopping, arts, dining and entertainment surrounding the Shore Club. Ideally located just a one block from the beach and one block to Pass-a-Grille Channel on the Inter-coastal Waterway it is the perfect vacation spot. Hip Caribbean brackets cast delightful shadows from our strong tropical sun. Horizontal railings minimize view obstruction when sitting down while lending a forward vibe to the design. Third floor porches are shaded by a fragrant vine covered trellis. At bar level, louvered panel guardrails and piers topped by ”finials” are subtly illuminated to create a night time landmark. A timeless building with details that are both innovative and traditional.